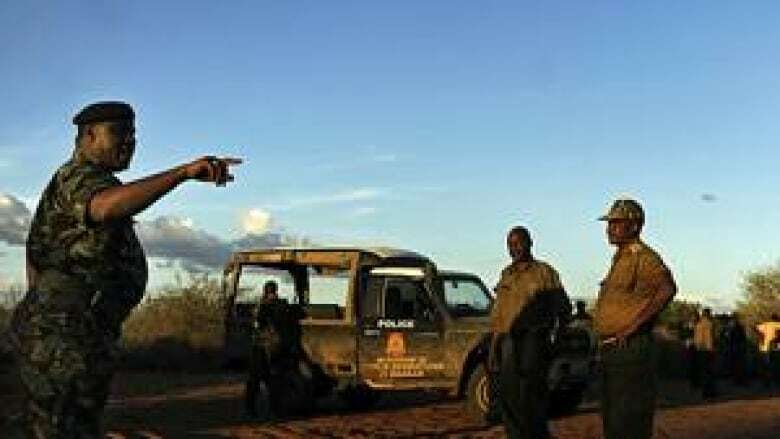 Kenyan military forces have moved into southern Somalia to pursue suspected Islamist militants after a series of kidnappings along the border, a Kenyan government spokesman said Sunday. The military push Sunday comes one day after Kenya's top defence officials said the country has the right to defend itself after the abductions. Kenya's government spokesman, Alfred Mutua, said government troops "are pursuing al-Shabab across the border." The Associated Press and Britain's Daily Telegraph reported residents in southern Somalia as saying that columns of Kenyan troops had moved in and that military aircraft were flying overhead. The news agency quoted Ali Nur Hussein as saying Kenyan troops arrived in tanks and military trucks and were coordinating with Somali government soldiers. The CBC's Carolyn Dunn, reporting in Kenyan capital Nairobi, said Kenya's "extraordinarily aggressive move" is aimed at preventing the militant group from operating in the region. The Kenyan government blames four high-profile kidnappings of foreigners and a recent murder on the group, but had taken little action against it until now. "They think this type of activity is a real black eye to Kenya, and going to keep tourists away," Dunn said Sunday. "They are now declaring al-Shabab the enemy." Two female Spanish aid workers with the group Medecins Sans Frontières (Doctors Without Borders) were seized Thursday from Kenya's Dadaab refugee camp, which is the temporary home to 450,000 refugees, mostly from neighbouring Somalia. The United Nations temporarily suspended all non-lifesaving aid operations in the Dadaab camp following the kidnappings. Hundreds of staff are confined to their offices, forcing the cancellation of services like education, counselling and relocation of families until further notice. Security has long been a concern at Dadaab, where representatives from various factions seek to recruit disaffected young male refugees as fighters.